There have been many questions concerning batteries on our forums, and UKCampsite.co.uk Member "Bailey Oklahoma" has compiled the following article to help all those that are confused or in doubt, stating he has explained the basics only to avoid confusion. Please note these are the words and opinion of the author only, and you should seek professional assistance if in doubt. Gelled Electrolyte – The electrolyte is a jelly and so will not leak. The electrolyte cannot be diluted so that over charging must be avoided and these batteries may only last for 2 or 3 years in hot climates although with good care they can last for 5 years. At least annually thoroughly clean the battery tray, terminals and connectors and smear the latter with petroleum jelly. Unless sealed for life, remove the battery vent plugs or strips and shine a torch into each cell to check the liquid level, which should cover the top of the plates. If the plates are exposed, top up with distilled or de-ionised water ONLY. 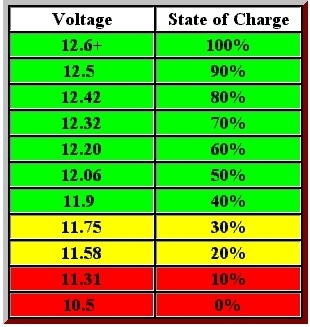 A digital voltmeter is the easiest way to check the voltage across the battery terminals. The chart opposite is a guide to the state of a battery. Some batteries, often called 'maintenance free' or 'sealed for life', have cells that have no filler caps, and which are not intended to be topped up with water. It is important that such batteries are not allowed to 'gas' since this will reduce the level of the electrolyte in the cells, which cannot be topped up. It is known that 'gassing' commences when the voltage at the terminals of the battery rises above a level which for most batteries is around 14.1 Volts. Below this voltage there is negligible gassing. It is therefore important with such batteries that the voltage at the battery terminals is kept below this value. Such batteries are preferably charged with an automatic or voltage controlled battery charger. Sealed batteries can be charged with care using a normal battery charger but this then requires the use of a multimeter. Maintenance-free batteries frequently appear to be completely sealed. However, like standard batteries, they do have openings for the release of gases. Never leave your battery connected to a caravan charger for more than the time required except when using a C-Tek charger (See Below) or similar. Although the caravan charger system is sufficient, the technical disadvantage is it never fully charges the battery to its full capacity. The charge voltage is cut off prematurely at 13.85 volts. Whichever type of battery you use, the in built charger will give a maximum charge to within 80% of the batteries original capacity. Over a period of time, this can cause sulphation of the plates in leisure batteries, due to under charging. Over charging occurs when the battery remains on charge after it has reached full charge (14.40 volts). Overcharging causes excess heat that can cause the plates within the cells to buckle and shred their active material. The battery will also react to the overcharge by producing excess hydrogen and oxygen as the water within the electrolyte breaks down. The water that is lost due to overcharging can be replaced in a non-sealed battery. In a sealed battery, the water loss is permanent and will drastically shorten battery service life. All batteries are manufactured to provide a certain number of deep discharge cycles. A cheap battery should give a cycling life of between 20 - 300 deep discharges if you're lucky. A Gel battery will give between 400 - 500 cycles and an AGM battery 600 - 800 cycles. A battery with a 5 year plus guarantee will generally give 1000 plus cycles. If the battery was left discharged for a week or so, it is likely that it has become sulphated. This means that a permanent change has taken place, which may render the battery totally useless. A sulphated battery is scrap and will not hold a charge. In any event, a battery will not last forever and its life will depend on how well it is maintained and how often used. Another type of leisure battery made by some manufacturers uses carbon fibre in its construction, which is claimed to inhibit sulphation and will therefore give an improved performance and enhance its active life. Always re-charge a battery after use and if the caravan is to be stored for more than one month, ensure the battery is removed and stored in a fully charged condition in a cool, dry place. Check every two months and re-charge if necessary to ensure long and trouble free battery life. A battery left below 12.4 V will deteriorate quickly and will not be able to be recharged to its original capacity. If charging the battery when removed from the caravan, ensure that the premises are well ventilated, and do not smoke nearby otherwise BOOM. The latest electronic chargers mostly make use of the IUI charge profile for lead acid batteries. This means that the current drawn by the batteries is allowed to flow at a constant (I) rate while the voltage is allowed to rise of its own accord, which it will do as the battery starts to be charged up. This first part of the charging cycle is known as the bulk charge phase. When a preset voltage has been reached, normally the voltage at which the batteries just start to gas, the charger will switch into the constant voltage (U) phase and the current drawn by the battery will gradually drop until it hits another preset level. This second part of the cycle is really the finish charge where the battery just topped up to the brim very carefully at a much gently diminishing rate. Finally the charger will switch again into the constant current mode (I) and the voltage is allowed to rise again, up to a new higher preset limit, in order to achieve a successful equalization charge. In time a battery will lose its charge, even with no equipment attached. Modern batteries lose 0.1 to 0.2% of their charge per day at room temperature, even when new - hence a newly purchased battery may not be fully charged. As batteries age or temperature increases, so does the self-discharge rate. Storage also affects the rate of discharge. A battery should never be stored directly on the ground and especially not on concrete. The best storage method is wooden pallets which do not conduct or allow damp paths and do allow good air circulation. During storage, most manufacturers recommend a freshening charge once every two months or so. Which Battery Charger Should I Buy? The Ctek CTE-XS3600 4 Stage Battery Charger is a switch mode charger with pulse maintenance for lead-acid batteries between 1.2 Ah to 120 Ah and is one of a series of professional chargers from CTEK. It represents state-of-the-art technology within battery charging. 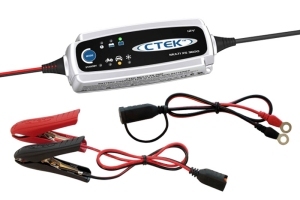 A Ctek CTE-XS3600 will prolong the service life of your battery. Bulk - Charging where 80% of the energy is returned. The charger delivers an almost constant current until the battery voltage reaches maximum level. Absorption - Charging up to almost 100%. The charge current falls and the voltage is kept constant at the maximum level. Pulse - Maintenance phase, where the charger delivers a pulse if the battery voltage drops. Charging varies between 95% and 100%. The battery receives a pulse when the voltage reduces keeping the battery in good condition when not in use. This charger can be connected for months. This charger begins charging with an almost constant current (0.8A or 3.6 A) until maximum voltage (14.4 V or 14.7 V) is reached. The charger changes mode at this point. It locks the voltage at maximum level and allows the current to drop. The MULTI XS3600 switches automatically to pulse maintenance charging when the current drops to 0.4 A. The charging cycle restarts if the battery voltage drops to 12.8 V or 12.9 V .
From the above information, you can see why it is one of the most popular chargers. I have replaced the on board factory fitted charger with the C-Tek, and the battery is six years old. Solar panels are an ideal way to charge a battery. 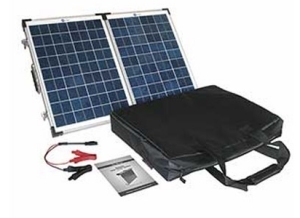 There are many different types of solar panels available from the inexpensive to the top of the range. They have improved considerably in the last few years offering practical power in compact sizes. Once installed, they require little or no maintenance allowing you to enjoy your leisure time knowing that you will always have sufficient power when it is required. A regulator is required with any solar panel above 22 watt. The regulator switches to pulse charging when the battery is 95% charged and turns off completely when charge is completed, turning on again only when required to keep the battery topped up. 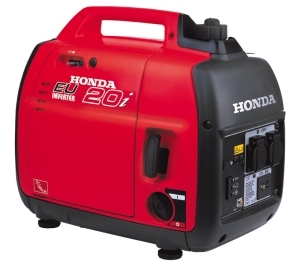 There are many different types of generators widely used, which offer a quick solution to charging a low/flat battery. Whilst using the generator to charge your battery, always ensure the electrolyte is above the plates. If your battery is low on electrolyte, you can inadvertently damage the plates of the battery and cause premature failure of the product. It is not advisable to leave your generator continually connected to the battery. Always disconnect the generator when the battery is fully charged, and follow the manufacturers guidelines on safety, (Important: To ensure no damage to batteries is sustained whilst charging with a generator, use a Multimeter to check charging voltage when 14.40V is reached, switch off the generator). Caravanners used to move their leisure battery into the back of the tow car to achieve a higher charge rate from the alternator. 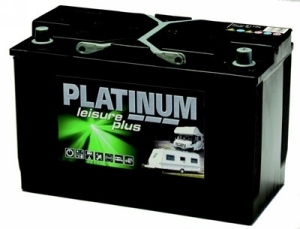 The caravan battery or a spare battery can be recharged simultaneously with the car battery from the car's alternator and the most effective place to locate the caravan battery is in the car boot. (The shorter cable run, and the use of a larger cable, results in a greatly increased charge rate over a battery situated in the caravan). The battery should be connected in parallel with the car battery that is the positive terminals are connected together, as are the negative terminals. Batteries should not be left connected unless on charge or they will attempt to equalize and so discharge one another. It is therefore essential to fit some device which will automatically disconnect the caravan battery when the car ignition is switched off. 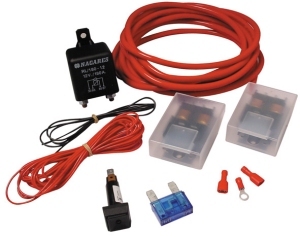 A split charge relay is the most effective method and is suitable for all types of vehicle alternators. The relay will come with installation instructions including the size of cable that can be used. Ideally the caravan battery should be enclosed in a box fixed to the boot floor. With the engine and ignition switched off, the relay isolates the car battery from the caravan battery. When the engine is started or the ignition switched on (depending on the method of relay connections) the batteries are connected together and will receive a charge. If your battery has a venting tube, make sure this is routed to the outside of the vehicle. A battery charged or stored in the boot of a car must be secured in a suitable frame; if a battery were to overturn the acid would be a serious safety hazard. Even a 'sealed' battery has vent tube which would allow the acid to escape. Please note these are the words and opinion of the author only. Neither the author nor the website can be held responsible for any errors or omissions. You should seek professional assistance if in doubt. The article contains links to Amazon where you can buy all of the products mentioned.